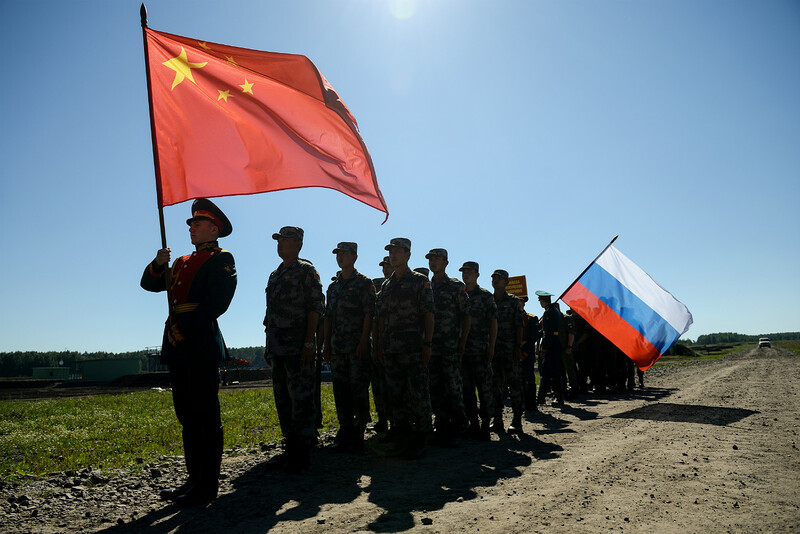 Members of the Russian and Chinese teams at the closing ceremony of the Masters of Reconnaissance competition as part of the International Army Games held in the training compound of the Novosibirsk Military Command College. On Jan. 12, Moscow and Beijing said they will take joint action against the U.S. missile defense system to be deployed on the Korean Peninsula. Experts say this ABM system may be easily transformed from defensive into offensive, and that Washington is basically pushing Russia and China towards cooperation in missile defense. On Jan. 12, Russian and Chinese deputy foreign ministers agreed to maintain a strategic balance of forces in Northeast Asia and to jointly counter the U.S. missile defense system, THAAD, which will be deployed in South Korea, reported Interfax news agency. According to the Russian and the Chinese ministries of defense, the capabilities of the U.S. global missile defense system, and in particular of its European component, exceed defense requirements. North Korea’s ballistic missile program is in its infancy, whereas Iran, against whom the U.S. missile defense system in Europe is ostensibly targeted, is no longer a serious threat since agreements on Tehran’s nuclear program were reached, remarked Lt. General Viktor Poznihir, first deputy head of the main operational department of the Russian General Staff. "Under the pretext of countering what the Americans allege to be North Korean and Iranian missile threats, a system is being deployed that is primarily intended to counteract and threaten Russian and Chinese missiles," General Poznikhir said. "The decision to deploy a U.S. missile defense system was taken two years ago to protect South Korea from its northern neighbor, and it's a powerful missile defense system that will be able to hit enemy ballistic missiles shortly after they launch," said Alexei Maslov, head of the Oriental Studies department at the Higher School of Economics. The THAAD system was developed by the U.S. defense giant, Lockheed Martin, and is effective against short-range missiles (up to 500 miles), Maslov added. "The system will be deployed in the immediate proximity of the North Korean border, but some elements will be deployed deep in South Korean territory," said Maslov. ``In effect, there will be several lines of defense." The radar component of the system, he continued, will be able to cover an area with a radius of 600 miles, which means that it also covers parts of Russian and Chinese territory. THAAD will be equipped with U.S. Patriot surface-to-air missile systems, as well as the Aegis Ashore system with MK-41 launching systems for SM-3 interceptor missiles. These missiles can destroy satellites in low Earth orbit, said Maslov. What worries Russia and China? "China and Russia are unhappy that the Americans are deploying a system that impinges upon both of our countries’ military infrastructures instead of jointly addressing the North Korea issue," said Dmitry Safonov, a military expert with the daily newspaper Izvestia. He added that MK-41 launching systems can be equipped not only with SM-3 interceptor missiles but also with Tomahawk cruise missiles that have an effective range of 1,500 miles. Thus, a missile defense system can easily turn into an offensive one. Safonov and Maslov agree that Washington is inadvertently pushing Moscow and Beijing to cooperate and develop a joint missile defense system. "We have held a series of talks with the Chinese on this issue, and our two countries are working on a plan of joint action," said Safonov. ``"They are also considering to hold a joint missile defense exercise since it is necessary to have preparation drills." Yet, not all analysts think Russia will pursue an aggressive policy in order to counter the U.S. missile defense system in South Korea. Most importantly, Moscow will not deploy additional forces in the Russian Far East, or direct its missiles on elements of the THADD system, or otherwise complicate relations with Seoul, said Viktor Murakhovsky, editor in chief of the Arsenal Otechestva (Arsenal of the Fatherland) magazine. "The THAAD system in South Korea is not a strategic but rather a tactical one, and it does not pose a direct threat to Russia because our strike forces are deployed at a distance that considerably exceeds its capability," said Murakhovsky. ``THAAD is more of a headache for China because its strategic nuclear forces still are rather limited in terms of their number and capabilities." Murakhovsky added that the Chinese leadership will talk and haggle with the U.S. on this issue, and the development of a joint missile defense concept with Russia is a backup plan. "Regarding North Korea, Moscow will push for political and diplomatic rather than military solutions," said Murakhovsky. "We’ll try to resume six-way talks on Pyongyang’s nuclear program with the participation of the world’s leading powers." Read more: How could Russian-NATO relations break down in 2017?